FDT 3.2 beta was just released this morning, including support for MXML and Flash CS4. You can find instructions for updating to the beta here. Over the years, Stumptown’s become a central haven for independent thinkers with a quirk and a twist, producing some of the most darkly observant and refreshingly honest talents of our time. That is what the Cut&Paste website says about Portland. And while I'd have to concur, tonight's competition will certainly be telling. If you are unfamiliar with Cut&Paste, it is a digital design tournament taking place in 16 cities this year ending with a global championship in New York City. New this year are 3D and Motion competitions, in addition to the legacy 2D competition. I kicked myself for not attending last year, especially once Tim May, the winner of last year's 2D competition joined us at XPLANE as Senior Interactive Designer. If you can't make it to the competition tonight, you can watch the live webcast on the Cut and Paste website. Yes indeed, "this nook in the Northwest, the City of Roses, is the new bohemia." Looking forward to seeing it tonight. I've always wondered, "is there a way to select an object on the stage and then have a command tell me where that symbol is in the library?" For a Flash developer, this comes up at least once a day. After some searching I came across a JSFL command for Flash CS3/CS4 that finds the parent symbol in the library of the item currently selected on the stage. You can also replace CS4 with CS3 for your flavor of choice. Once installed, select the object on the stage that you wish to locate in the library and is likely buried way, way deep inside nested folders that the Illustrator to Flash process created. In the toolbar choose "Commands" and then "Find in Library". The object will now be highlighted in your library panel. Digging for the symbol no longer required. I'd like to point out that I am not claiming to have written this script, but I found it on some site far, far off on the Internet and which I can no longer locate to provide credit where credit is due. I do remember, however, it was provided "free and open source", so all should be well. 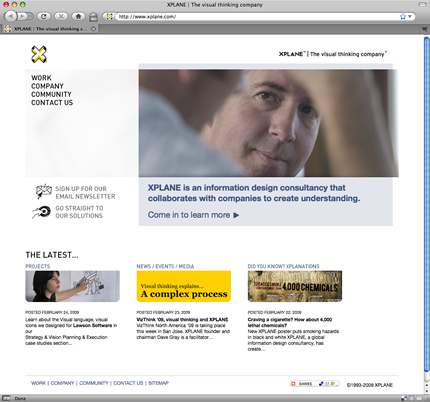 XPLANE is an information design consultancy that drives better results for many of the world’s leading corporations including Microsoft, Intel, Nokia, U.S. Department of National Intelligence, U.S. Marines, Nike and BP through visual thinking and design. 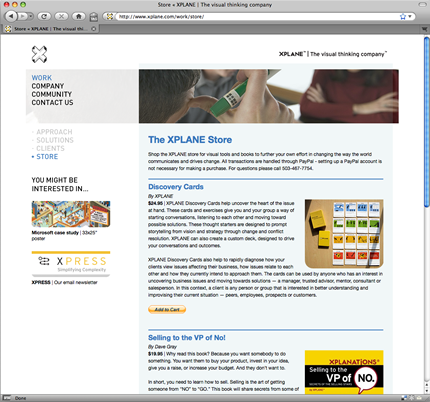 Working with the internal marketing and design teams at XPLANE, the entire website was built on the WordPress platform utilizing a custom developed theme to match XPLANE's branding. 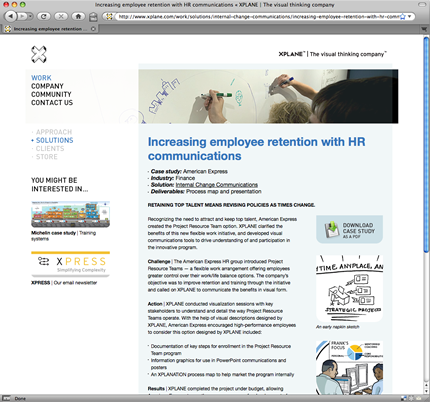 Content highlights include project case studies, company news, and an online store. The internal marketing team handles all day-to-day updates utilizing the content management features of WordPress, allowing them to eaisly add, edit and remove all content on the website. Since the site launch XPLANE has also seen significant increase in search engine optimization (SEO) and daily unique page views. The site is listed in the WordPress Showcase, an honor since only a relatively small number of submissions are added to the showcase. 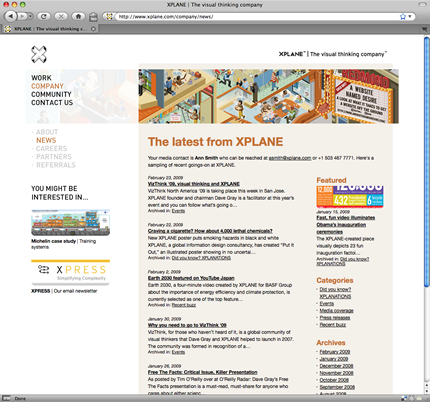 To see the full site, visit http://www.xplane.com.